Find My Workspace lists over 95% of the coworking space & business centers market in Montmartre. Simply click Request Quote to check pricing for one office, or Add to Basket for multiple offices. Close to central Paris and in a modern, recently refurbished building this is a centre that could really help your business prosper. Co working and private offices are available on flexible contracts , allowing you the opportunity to work at times that suit you. There is access to multiple meeting rooms which can be tailored to suit both formal and casual occasions. 24 hour security is also provided and the centre is open until late so it suit those who need to work longer hours or have to communicate with those in international time zones. A spacious kitchen is on site which keeps queuing at lunch to a minimum. Car parking is also available at no extra cost. The centre is fully staffed in order to help and support your business develop. Receptionists can handle calls and post and there is a janitorial team to maintain the cleanliness of the centre. 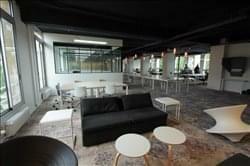 This work space would suit multiple companies whether they be a new start up or an experienced corporation. To obtain information for your selected Montmartre Coworking Space & Business Centers, please tick the "Add to basket" box for each office you prefer and complete the form below. We will then send a detailed report via email.